UPDATE, 1:30 p.m. January 21: Congressional leaders were unable to reach a deal on Friday, and the federal government officially shut down Saturday morning. Democrats, congressional Republicans, and President Trump continued to trade jabs through the weekend in a bid to assign blame for the closure. As of noon Sunday, senators were slated to vote again at 1 a.m. Monday on a proposal to reopen the government through February 8, possibly including an extension of the Children’s Health Insurance Program and disaster aid for states hammered by hurricanes this fall, according to The Washington Post. The deal, though, doesn’t address protections for Dreamers, the young people brought to the country illegally as children, and it remained unclear if enough Democrats would vote for the bill to meet the Senate’s 60-vote threshold, Politico reported. Should Congress fail to act by Friday to save the Deferred Action for Childhood Arrivals program — regardless of whether a short-term spending bill averts a government shutdown after midnight — a window to save “Dreamers” from potential deportation may slam shut. 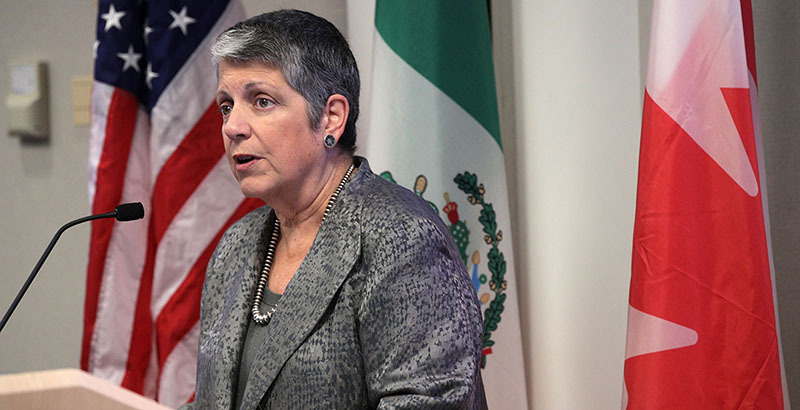 Janet Napolitano, president of the University of California System and one of DACA’s creators, was among a bipartisan trio of Department of Homeland Security secretaries that told Congress earlier this month they needed to act by January 19 if they wanted to save the program without causing major hiccups. Should lawmakers reach a legislative fix after the 19th, it’s likely thousands of recipients will see a lapse in DACA services even if a replacement is approved before the program ends in March. “The realistic deadline for successfully establishing a Dreamers program in time to prevent large scale loss of work authorization and deportation is only weeks away, in the middle of January,” according to the letter, which was sent to congressional leadership from Napolitano and Jeh Johnson, who served as homeland security secretaries under President Barack Obama, and Michael Chertoff, who served in the same role under President George W. Bush. Napolitano is also suing the Trump administration in an effort to keep the program alive. Implemented by the Obama administration in 2012, DACA has granted work permits and deportation relief to some 800,000 undocumented immigrants, commonly referred to as Dreamers, who were brought to the U.S. as young children by their parents. The Trump administration announced last fall it would phase out the program in six months — giving Congress until March 5 to reach a more permanent solution. After a months-long stalemate in Congress, Democratic leaders maintained as late as Friday evening that they’re willing to force a government shutdown should immigration reform be absent from the budget bill. But just this week, negotiations have hit several roadblocks. On Wednesday, for example, White House Chief of Staff John Kelly told members of the Congressional Hispanic Caucus the president’s campaign demands for a wall along the U.S.-Mexico border were “uninformed,” which prompted an early-morning Twitter rebuttal from Trump. Ahead of impending shutdown, the House approved a stopgap spending bill late Thursday to keep the government open through February 16. On Friday the White House maintained there is “no emergency” because Congress has until that deadline to act, but by 5 p.m. Friday evening, President Trump and congressional leaders were still scrambling to avert shutdown. Senate Minority Leader Chuck Schumer, a Democrat from New York, met with Trump at the White House in the afternoon, where they made “some progress” but disagreements remained. Beyond the thousands of students who are DACA recipients — or are the children of program beneficiaries — an estimated 20,000 are teachers, including Ivonne Orozco, a Spanish teacher in Albuquerque, New Mexico, who recently was named state Teacher of the Year for 2018. About 190 Teach for America educators and alumni are DACA recipients, serving roughly 10,000 students in 11 states, said Viridiana Carrizales, the nonprofit’s managing director of DACA Corps Member Support. Without new legislation, DACA status will expire for several TFA teachers in April, she said. Amid uncertainty, they’re already preparing for life without work authorization and deportation relief. Likewise, school principals and human resources officials have started to ask recipients if they plan to return next year. In the letter to Congress, the former Homeland Security secretaries said lawmakers must move speedily on a legislative fix to meet “significant administrative requirements of implementation.” When DACA launched in 2012, it took the government 90 days to approve the first applications. Any new program, they wrote, must allow adequate time to process applications. Approving a new system by Jan. 19, they noted, would allow only 45 days for implementation before March 5, when an estimated 1,200 people will lose DACA benefits each day. Alberto Carvalho, superintendent of Miami-Dade County Public Schools, who is himself an immigrant, offered a similar sentiment on Twitter Friday. Even as Congress debates a legislative fix, Napolitano has also sought relief for Dreamers through the courts, filing a lawsuit against the Trump administration in September on behalf of DACA recipients at the university system she leads. Last week, a judge for the U.S. District Court for the Northern District of California issued a temporary injunction, requiring the Trump administration to keep DACA in place until lawsuits spurred by the decision — including one filed by a TFA teacher — make their way through the courts. While expressing remorse that Congress has so far failed to act, TFA’s Carrizales said she doesn’t plan to give up.